These pumps are cheap and widely used in most of households (in Europe I believe). Reliability due to lack of moving parts, high working pressure (around 6 bar at 300W power consumption) and low price ratio (30-50 USD) makes them so popular, besides of low maximum discharge flow (up to 1500 l/min). Market is full of choice between poorly and well made units. Lastly I got a few of these malfunctioning, it was economically unreasonable (yeah, I can't handle broken stuff laying around me) but surely fun to study and repair them. After such surgery machine should survive many years of intensive work. Original design patent comes probably from russia (it is common in there under names "Ручеёк", "Малыш") and was spread out and copied all around world but I couldn't find anything confident conforming that, yet. It occurred to be hard to find any information describing these pumps, especially in english (that's mainly why this note was written). Construction is pretty solid and kept simple, there are no frictional moving parts like bearings so there is very little to fail. Like in most of the systems, strong vibrations are the only one enemy of mechanical part, here they can make screws loose or metal fatigue. Whole casing is made of cast aluminum as two screwed halves. In between there is big absorber which acts like a spring, it is made of rubber with some aluminum plate in it. Absorber collects all the kinetics energy and releases it when magnetic field from electromagnet motor is in phase of weakening. 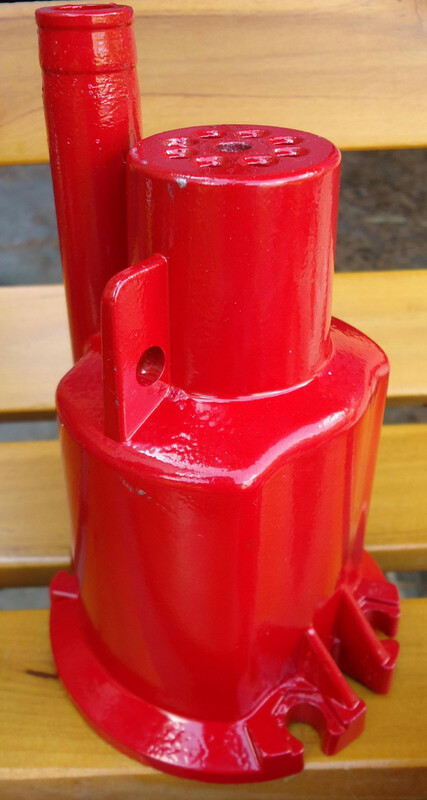 From quality of this part (or rubber which is made of) depends the final overall pump performance. 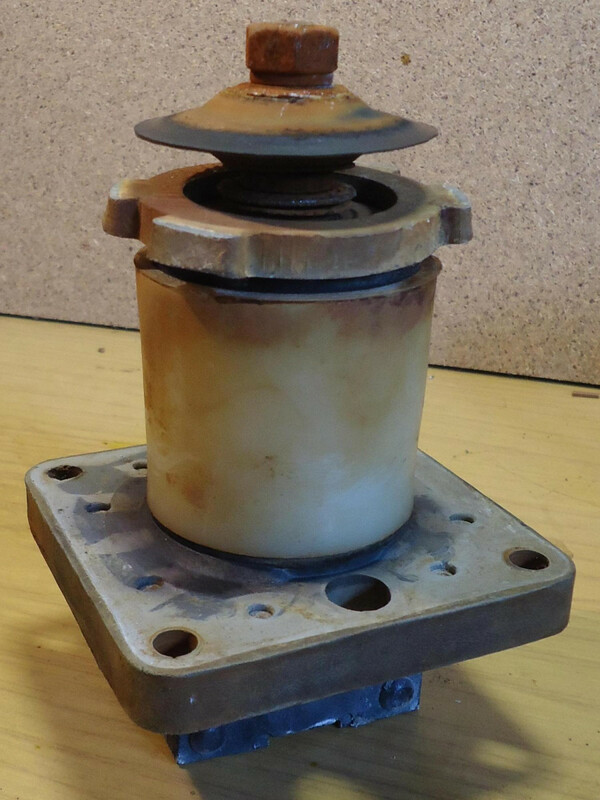 Absorber part divides also two casing chambers: dry when the electromagnet is and wet where water is propelled. Through the center axis of the construction there is a pivot noticeable, this steel rod transfers all the mechanical energy from the engine. Dry end of the pivot has a armature made of soft iron plates, on the other end there is the piston or better to name it propeller made of rubber. Of course pivot osculates due to alternating magnetic field produced by electromagnet. Pivot rod is hold in place by two nuts on other side to prevent self loosening. Those nuts are secured from water by plastic tube, additional rubber ring and aluminum ring - all being pressed together by key notches in casing. This also constrains movement of the rod much as possible to only vertical axis. Impeller and armature. This big chunk of gray rubber on it is an absorber. In wall plug socket there is available alternating sinusoidal current of 50 Hz frequency (60 Hz in some other lands). The motor which consist of magnetic core and coils, produces alternating field as well when current flows, but the core, made of soft magnetic material, gets excited on every voltage value above or bellow zero point, this results in magnetic field occurring 100 times per second (any peak of sine wave, but field with same direction still occurs 50 times). Magnetic filed lines are always creating a closed loops, cores in electromagnets, transformers and other machines are designed in a way to suit this rule. Here we can highlight loop in "U" shape electromagnet core which directs the magnetic flux onto "I" shape armature. When we took off armature electromagnet still works but there is a huge air gap being created in magnetic U loop, steel conducts magnetic flux fine but air poorly, this value of conductivity is described as magnetic reluctance. When a piece of soft magnetic material (armature) appears close to any other magnetic field it gets magnetized too but with opposite pole sign, this creates a force which pulls armature towards core, or in other words, armature goes into position where reluctance is minimal. Reluctance motors (motors without any permanent magnets) are built according to these principles. All the magnetic parts as always are made of insulated sheets of steel to minimize power losses from Eddy currents. 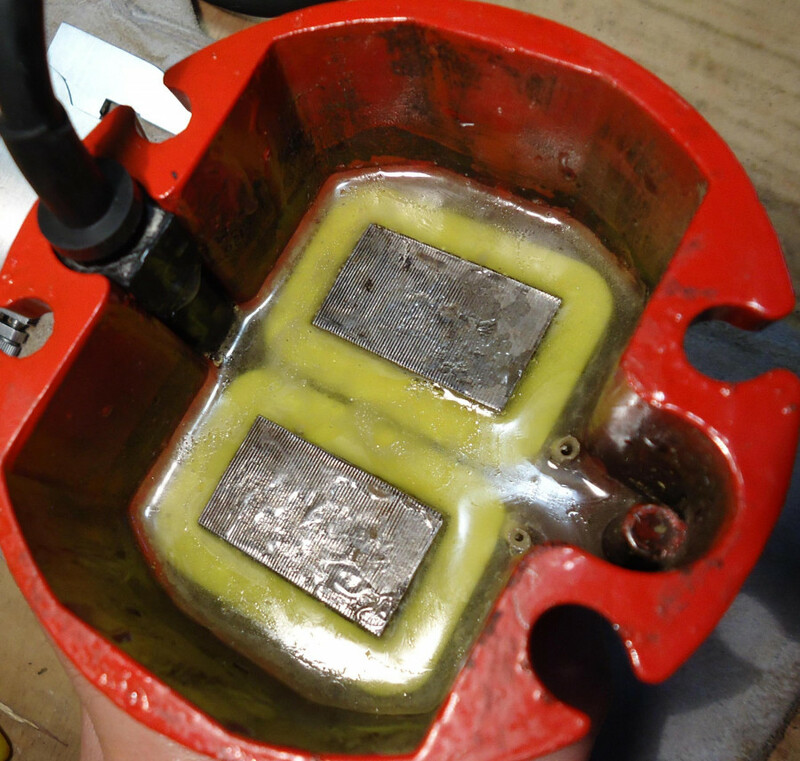 Whole electromagnet is flooded in epoxy resin with addition of quartz sand to improve heat dissipation. So now we realized how the motor work and that armature is being pulled 100 times per second, this energy is stored by absorber and released as a punch when magnetization disappears on zero volt crossing. How those osculations are being utilized to pump water? Well the first thing that comes to mind is a diaphragm pump which is not too bad, this is how this pump is often categorized, however there are noticeable differences which make this design extra ordinary and unusual. When you disassembly it first time you can notice only one valve, which is on the upper suction side as a rubber cap covering holes. But where is an discharge valve, is there any? Also diaphragm (impeller) is not tightly rigged on edges but it is rather a freely moving disc of rubber. After a while it becomes clear that impeller itself also acts as a discharge valve. 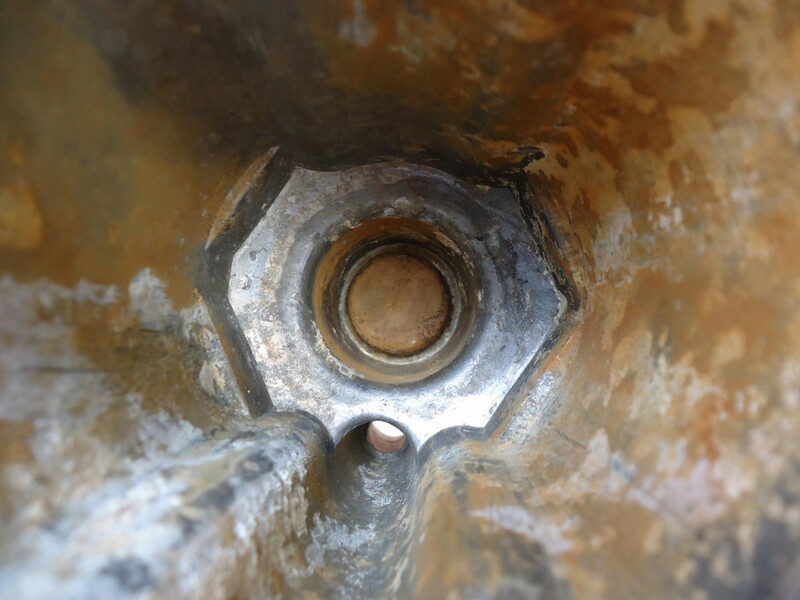 Another look on impeller from different unit and intake valve on the bottom of the casing halve. In operating conditions small chamber with intake valve inside it is filled with water. 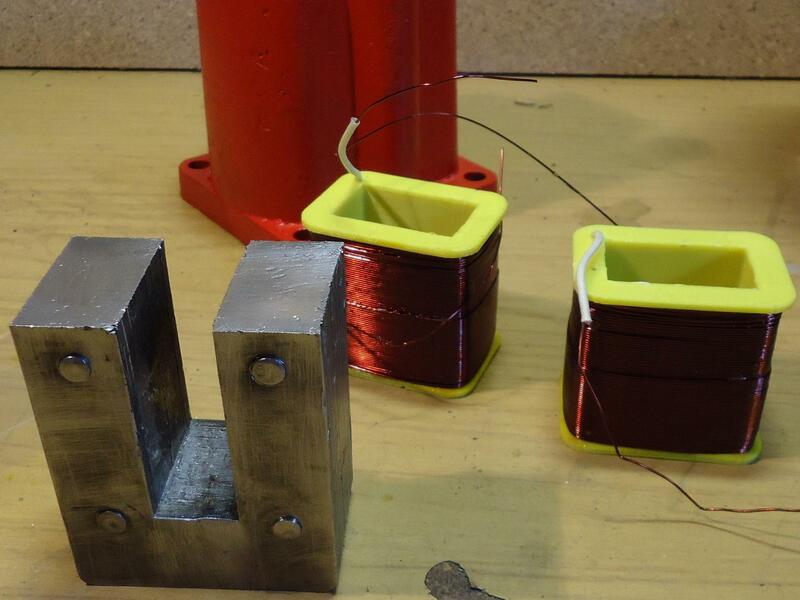 When supply voltage comes close towards zero point magnetic forces which are keeping armature disappear - rubber absorber spring pushes back pivot and impeller which is connected to it on the other side. When impeller hits the water, it produces a hydraulic stroke inside the chamber and intake valve closes. Water is not compressible and finds its way out between impeller soft edges and casing walls, right to the exhaust chamber and port. At the proper timing, voltage and magnetic forces are rising - armature with impeller are being pulled again, backwards, towards second marginal position. This in result lowers the pressure in chamber and opens the suction valve, at that time a soft edges of impeller rubber are pressed to the casing by pressure differences on it both sides - that seals the chamber from being filled with water from exhaust on suction phase. When marginal position is achieved, whole cycle starts over again, 100 times per second. 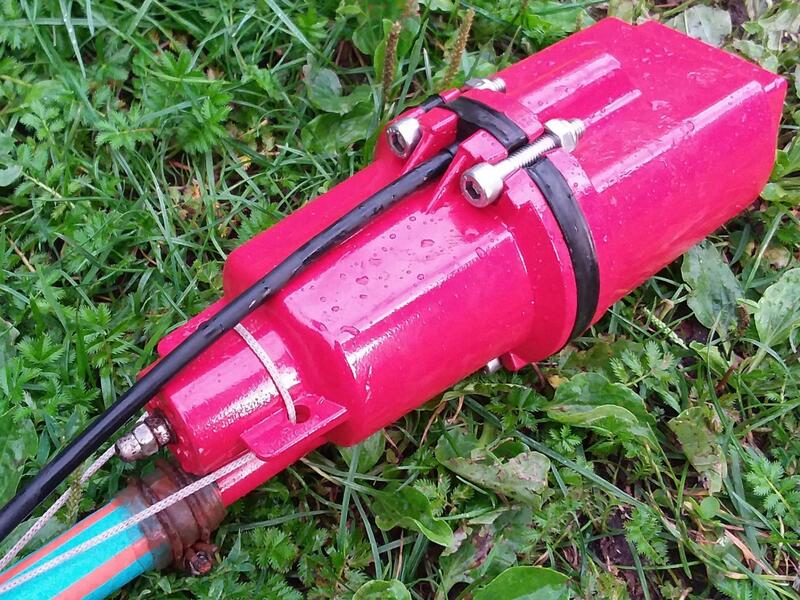 It is worth to mention that electromagnet and absorber spring are creating mechanical resonance circuit, thanks to it pump can lift the water to height of 60 m with so little power needed. That is also the reason why absorber quality matters, any changes in supply voltage or frequency also causes mismatching in resonance operating point and significant drop in performance and efficiency. An animation explaining how a vibratory pump works. Pump does not work, no any sound at all and/or the overload protection has worked and turned it off. 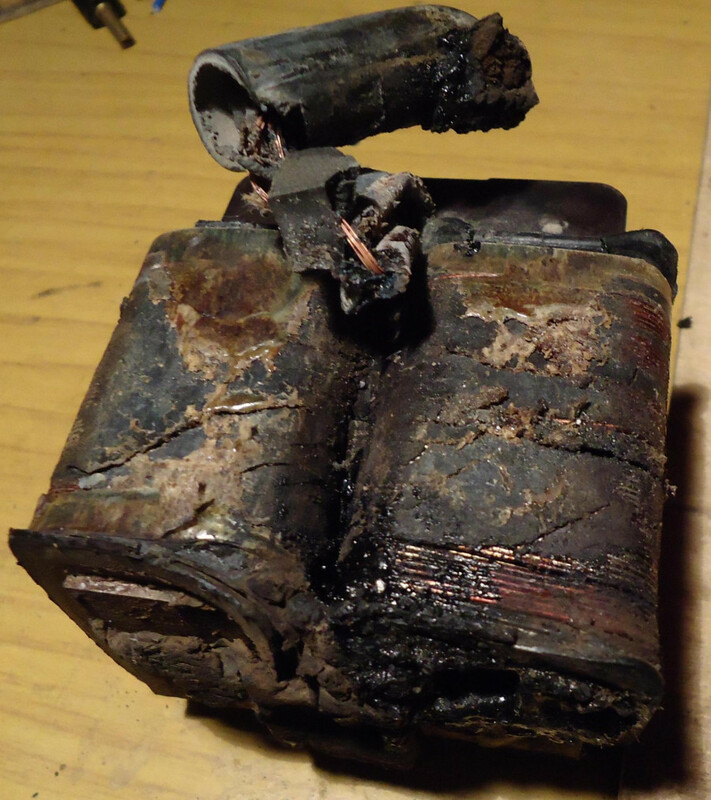 - There is a fault somewhere in power cord or motor windings, which were overheated and now there is open or short circuit. Pump does not pump water but it produces loud buzzing noise. 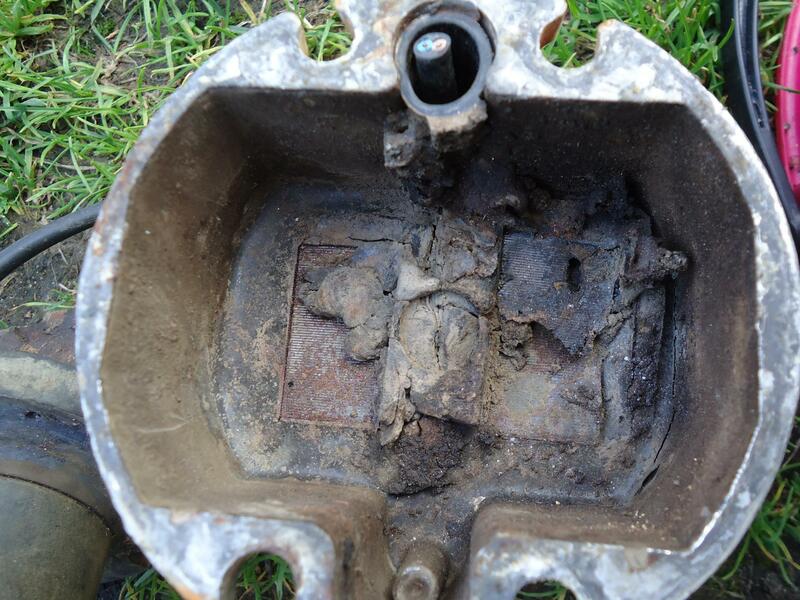 - Some of the screws may get loose, impeller or/and intake valve may be broken and needs to be replaced. Impeller may need a regulation by adjusting its position with additional washers. 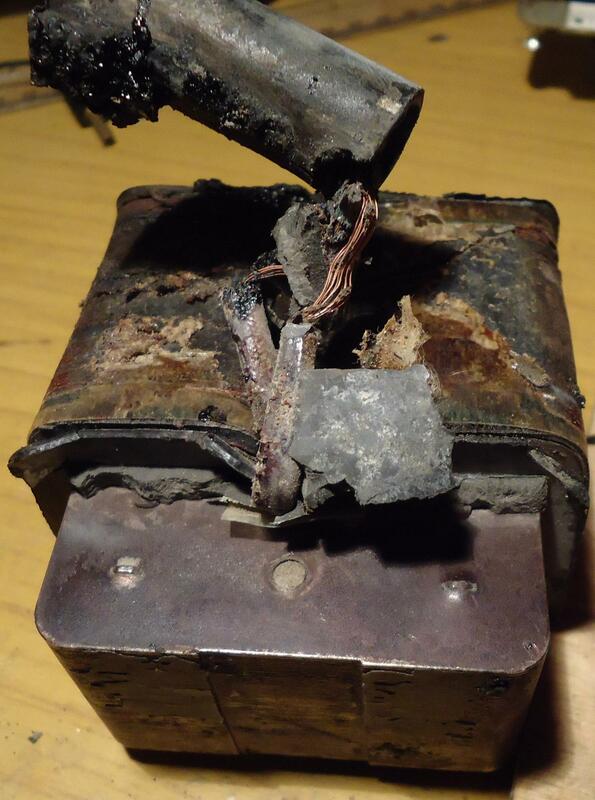 Last case (rare) is the epoxy which came off from casing and electromagnet has moved too far. Discharge flow is very poor. - same as above. In all cases it is needed to disassembly the casing and inspect the insides. Main four screws may be corroded so much that they need to be grinded off, replace them with stainless steel M8 ones with locking rings in nuts. 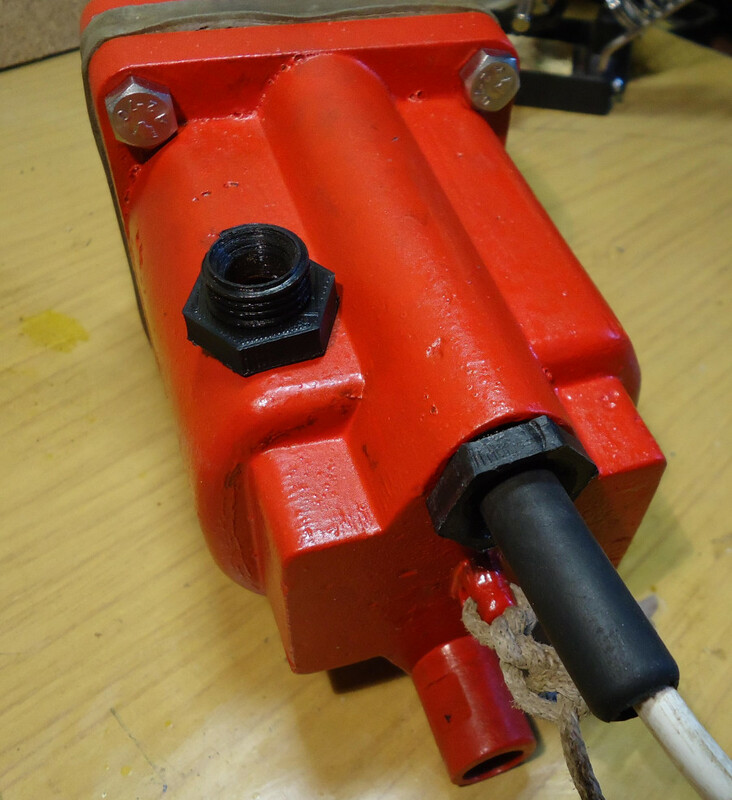 There should not be a water in electromagnet compartment and pivot protecting sleeve. 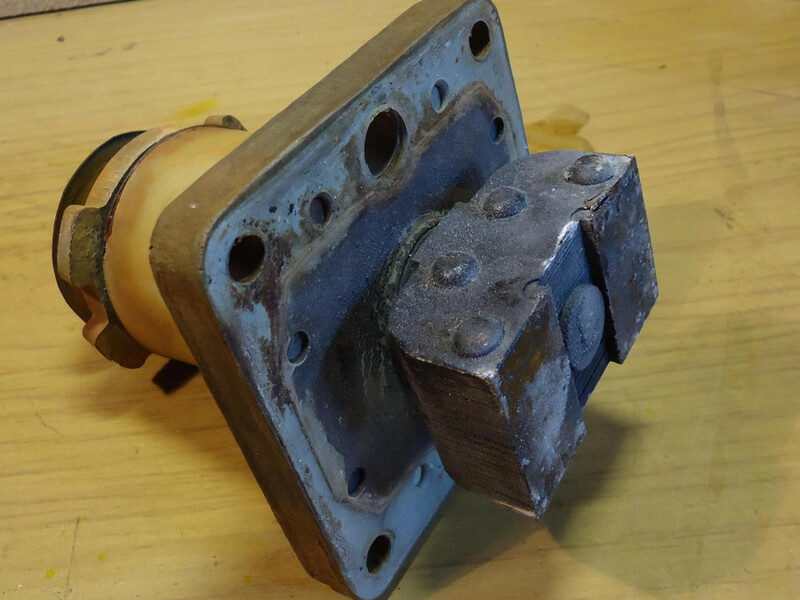 Clean up motor chamber from dust (there might be some metal from armature-electromagnet core collisions) and inspect epoxy for any cracks and other wired signs. Occurrence of any breaks means that windings have started to overheat and insulating material leaked out. Here motor is definitely roasted, motor repair is the most time consuming process. 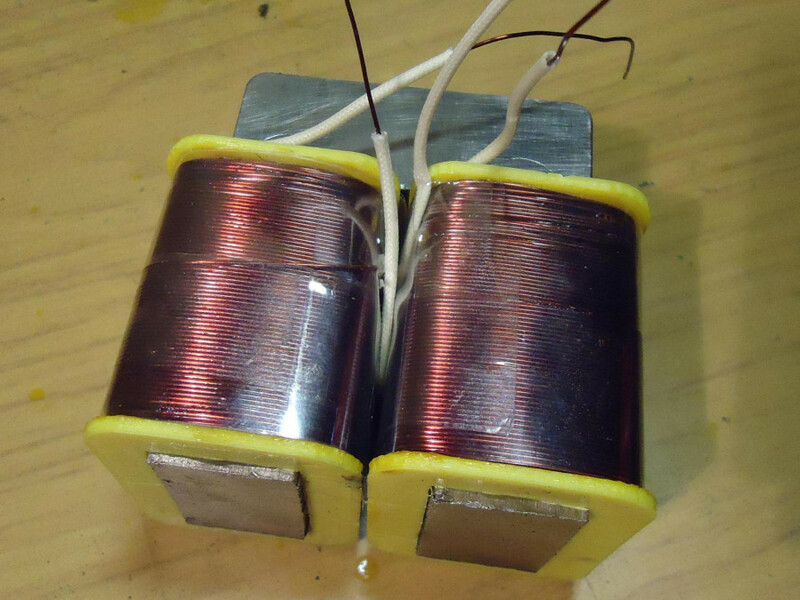 There is a simple trick how to get out an electromagnet out of the aluminum casing. Cut off the power cable and put whole part into an oven preheated to 250 C for 50 minutes (use some old oven and do it on a well-ventilated garage because of fumes). Using blow torch instead of oven does the job too but is less elegant. After preheating give it a few hits by stroking some wooden board, with chamber directed downwards. The epoxy should come apart and free core with coils. Electromagnet after removing from casing. Salvage the core and clean it up with wire brush. To prepare new coils it is convenient to make a new bobbins and wind the wire with some machine, which I described here. If you want to print a 3d model of bobbin, start from here. Alternatively do it manually, make bobbin from thick laminate. Winding details: originally for 250 W (at 230V) there is a copper wire of diameter 0,6 mm and number of turns between 400 to 460 per bobbin (there are two same of them). I haven't got any troubles by lowering the power consumption to 190W with 490 turns, 440 turns for 225W. In the case of thinner wire 0.5 mm increase the number of turns to 520. Both coils are connected in series and gives a resistance bellow 9 ohms. The correct ends of the coils terminals needs to be connected together, to produce consistent magnetic flux. I advice you to connect coils in series through thermal protection switch - rated for 5-10 Amps, normally closed and 100C opening temperature. Finding the right ends to short is easy if both coils are wound and slid into core in exactly same manner, just connect together their beginnings or ends. 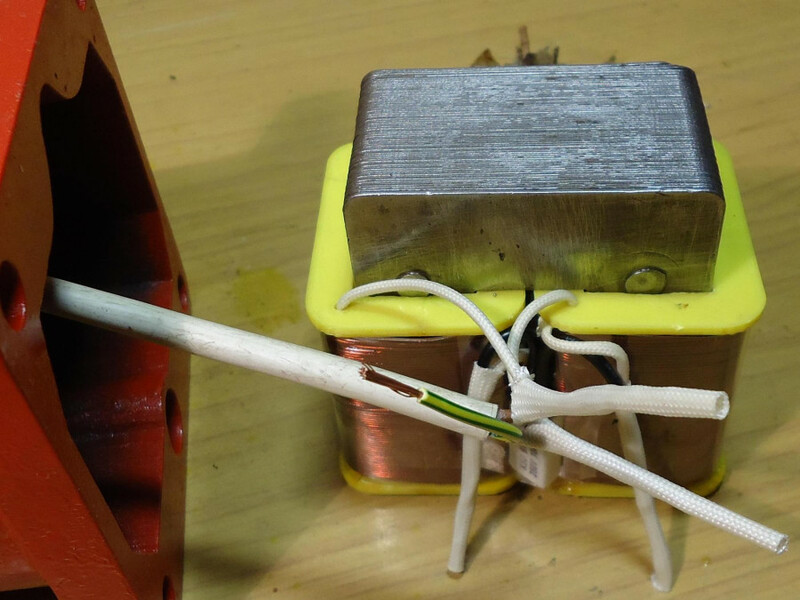 To make sure that everything is just as it should be, connect AC meter, short the electromagnet core by putting armature on it, turn on the power and meter should display value between 0.5 - 0.8 Amps. For wrong connections current value is much higher - just swap the ends of one coil to fix it. New DIY coils prepared for montage, they are secured by thin PVC film. Thermostat should be clamped tightly to the copper layer for best heat measurement. Soldered connections are secured with silicone coated glass fiber sleeves, and don't forget to connect grounding wire to the core and casing. When everything seems to be done, last step is to pour some epoxy resin - recheck something if needed because from there is no way return. I have been using low viscosity universal epoxy resin without any addition of quartz sand, about 120 grams with hardener is required to flood everything. Putting all into vacuum chamber is a good idea to quickly remove all the air bubbles, but not necessary. To speed up curing put it to the oven for 20 min at 60 C, but after a few hours when resin will soak through all the slits. Electromagnet flooded in epoxy resin. 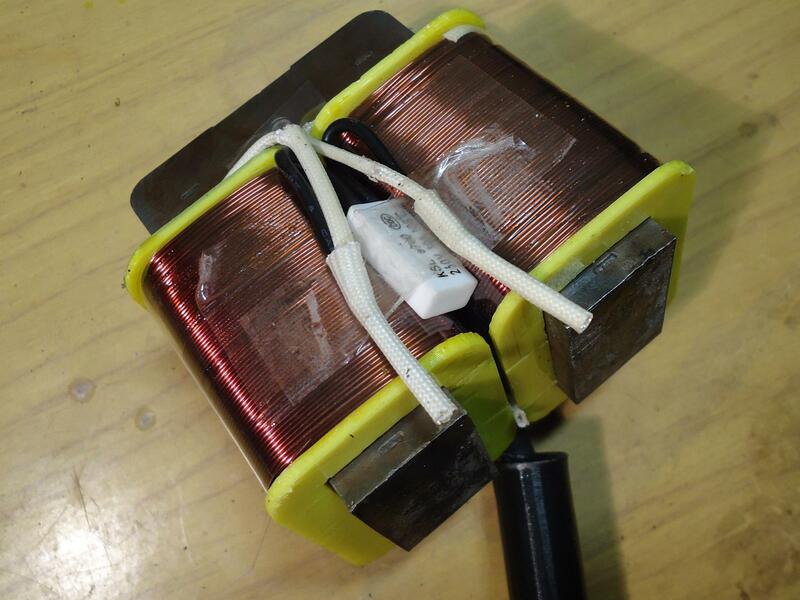 At first, measure the air gap between armature and electromagnet core, it should be between 4.5-5.5 mm. 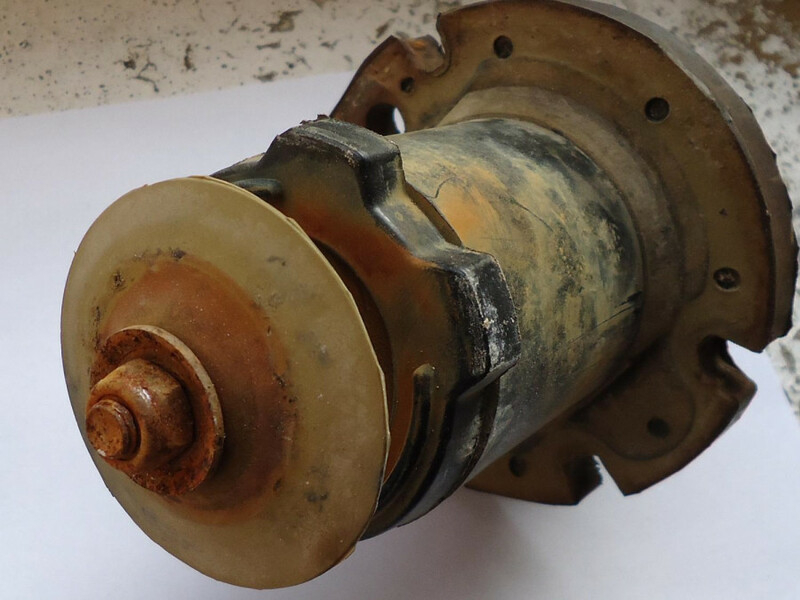 Too high value might increase power consumption and overheat the motor, too short distance will cause destructive tapping and noisy work. Adjust the gap by changing number of washers on pivot rod, between armature and absorber. To measure the gap, stick some piece of modeling clay to the core and put whole armature and absorber part on its place. Press both parts together and then measure how much clay was squashed. Having air gap checked, correct the impeller position if water flow is poor or not at all. Loose the impeller nut and add or remove extra washers underneath. Put everything together and test it out, repeat correction if necessary. For best results anyway, even when everything seems to be fine, there is some methodology - clog the discharge pipe with pressure gauge and seek for the point with highest value. Pump should always work within liquid, otherwise in non loaded system conditions, oscillations amplitude is too high and armature hits the core, whats might be dangerous in long run. Thermal protector is good when hose has bend too much or suddenly has clog up, limiting the water flow and overloading the pump. Remember about the duty cycle, 1.5 hour of work and 20 minutes of break. One of the pumps I have regenerated worked longer than two hours pumping water from well on height of 8 m and distance of 150 m - protection haven't turn it off so there is huge safety margin, the temperature hasn't exceeded 100C. Cheap units don't have any protection and coils are made of too thin wire, they heat up faster, even a aluminum casing is made sparingly. 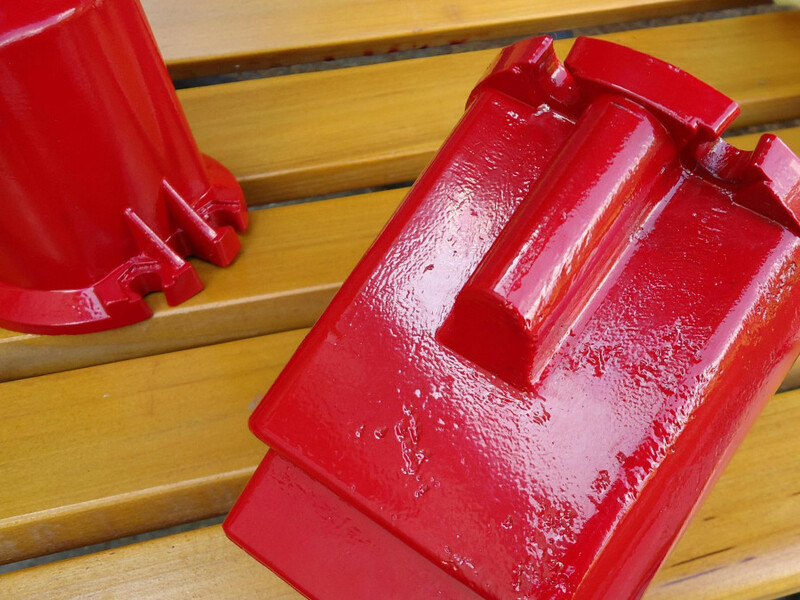 It is recommended to clean up and paint the aluminum casing, it will slow down the corrosion if the pump is in water all the time. 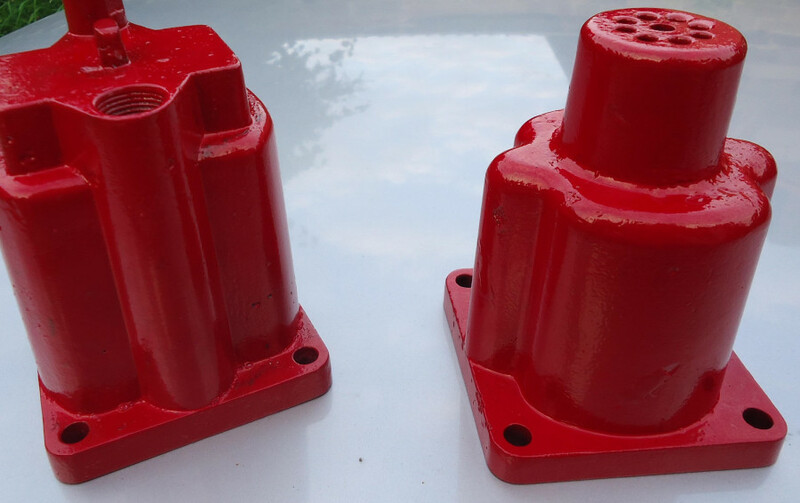 Casings halves from two different vibratory pumps, painted with powder coating technique.